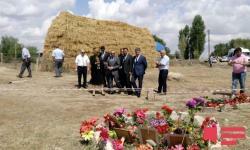 A group of Azerbaijani parliamentarians, including Vice Speaker Bahar Muradova visited the Alkhanli village of Azerbaijan’s Fuzuli region, which was recently shelled by Armenian militaries. 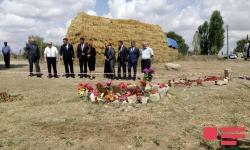 On July 4, Armenian armed forces, using mortars and grenade launchers, shelled the village. As a result, an Armenian shell killed two Azerbaijani civilians living in Alkhanly – Sahiba Allahverdiyeva and her 2-year-old granddaughter Zahra Guliyeva. 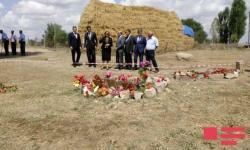 The Azerbaijani MPs inspected the place where the woman and toddler were killed. Later, they will meet with Alkhanli residents, APA reported on July 13. Azerbaijan’s villages in Fuzuli, Agdam, Jabrayil, Tartar and other frontline regions frequently face destructive acts by Armenian soldiers. By committing such provocations, the Armenian side deliberately seeks to cause harm to Azerbaijani people by making life at the border difficult and risky for them. Over the past 24 hours, Armenia’s armed forces have again 125 times violated the ceasefire along the line of contact between the Azerbaijani and Armenian troops. The Armenians shelled the Azerbaijani army positions near the state border in the Agstafa, Gazakh, Tovuz and Gadabay regions, as well as the Azerbaijani positions along the Nagorno-Karabakh frontline.